Most national and international problem solving efforts focus on only one pillar at a time. For example, the United Nations Environmental Programme (UNEP), the environmental protection agencies (EPA) of many nations, and environmental NGOs focus on the environmental pillar. The World Trade Organization (WTO) and the Organization for Economic Cooperation and Development (OECD) focus mostly on economic growth, thought the OECD gives some attention to social sustainability, like war reduction and justice. The United Nations attempts to strengthen all three pillars, but due to its consensual decision making process and small budget has minor impact. The United Nations focuses mostly on the economic pillar, since economic growth is what most of its members want most, especially developing nations. This leaves a void. No powerful international organization is working on the sustainability problem as a whole, which would include all three pillars. However, as the Great Recession of 2008 demonstrated, weakness in the other pillars can directly weaken the environmental pillar. Many nations and states are cutting back or postponing stricter environmental laws or investment, since their budgets are running deficits. Many environmental NGOs are seeing their income fall. If the Great Recession grew substantially worse and morphed into another Great Depression, you would expect the environmental pillar would get severely less attention, since eating now is a priority over saving the environment. The social pillar is critical too. Once a war breaks out environmental sustainability has zero priority. If a nation lives in dire poverty, the environment is pillaged with little thought for the future. 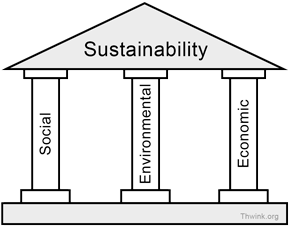 Therefore solutions to the sustainability problem must include making all three pillars sustainable. 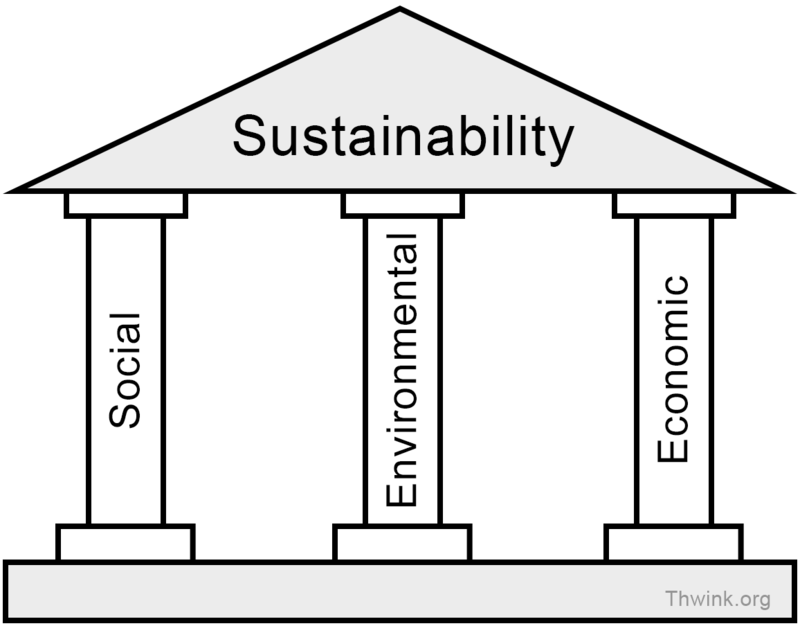 Thinking deeply in terms of the three pillars of sustainability requires systems thinking. You start seeing the world as a collection of interconnected systems. The standard diagrams for visualizing the three pillars are simplistic. To see the more correct relationship requires a diagram like the one shown. The largest system of them all is the biosphere we live in. It contains the human system, which has two main systems: social and economic. When groups of people, from a tribe to a nation, agree to form a government they form a social contract to increase their general welfare. This contract binds the social and economic systems of the group of individuals together. The people (the social subsystem) are working together under a central government to maximize their economic system's output. 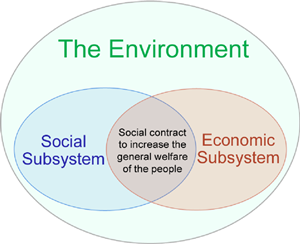 Seeing the overall system this way makes it clear that environmental sustainability must have the highest priority, because the lower the carrying capacity of the environment, the lower the common good delivered by the social system and the less output the economic system can produce. 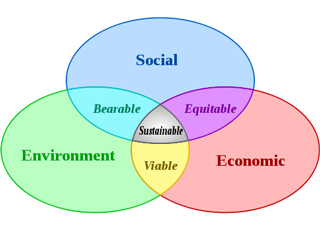 How do you analyze something as complex as all three pillars of the sustainability problem? Can the problem be solved? 1. The shortage of food problem - This was solved ten thousand years ago by the invention of agriculture. 3. The autocratic ruler problem - It was not so long ago that kings, warlords, chieftains, dictators, and the like ruled the world. Might made right. The vast majority of the population lived at the subsistence level. There was no middle class. The upper class aligned themselves with whoever was in control at the top. It was a system as old as human history. But it changed nearly overnight with the birth of modern democracy in the late 16th century. 4. The Cold War problem - From the end of World War II to the collapse of the Soviet Union in 1991, the free world held its breath in fear that nuclear war could erupt anytime. School children cowered under their desks during nuclear attack drills, as the arms race caused both sides to accumulate massive quantities of bombs. Mutually assured destruction (aptly abbreviated MAD) seemed like the only way to achieve detente. The Cuban missile crisis of 1962 brought the US and the USSR to the brink of launching missiles to protect their interests. But one side blinked and a holocaust was averted. If these problems can be solved, so can the sustainability problem. The first three problems were solved by invention of something new. But the last problem was not. What was common to the solutions that allowed them to solve all four problems? If we knew that it could help us solve the sustainability problem. Thwink.org is an information rich educational website. After you've considered that question, click on One Possible Answer. 1. The root cause of the shortage of food problem was total dependence of Homo sapiens on the what the environment naturally provided for food via hunting and foraging. Invention of agriculture changed that radically. Now Homo sapiens is only partially dependent on the environment for sustenance. 2. The root cause of the short lifespan problem was unchecked infectious disease. All the practices listed reduced chance of infection or, in the case of antibiotics, cured infection after it had started. 3. The root cause of the autocratic ruler problem was there was no reliable feedback loop between a ruler and his subjects. After democracy there was. 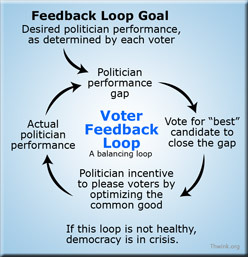 It was The Voter Feedback Loop. 4. The root cause of the Cold War was mutually exclusive goals between communistic and democratic societies. The root cause resolved itself when the Soviet Union collapsed due to the gross production inefficiency of its economic system, compared to democratic free market systems. Russia was forced to change its goal to one compatible with democracy, beginning with the courageous reforms by Mikhail Gorbachev of perestroika and glasnost in the late 1980s. 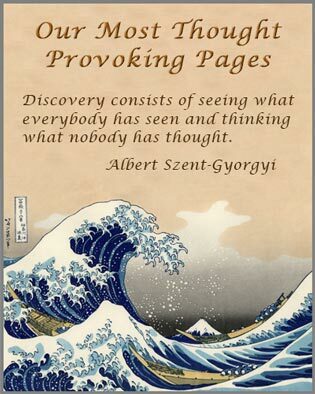 The pages of history whisper loudly if read closely. These pages tell us that the task before us is to find and fix the root causes of the sustainability problem. (1) The colorful three pillar image is from Wikipedia. The architectural style image was prepared by Thwink.org. It's based on numerous similar diagrams. (2) The information on British lifespans is from this article on Growing lifespan shows no sign of slowing, but don't expect immortality. The goal of three strong pillars of sustainability is a sustainable world. But what exactly is that goal? How well has it been defined? Unfortunately it's not been correctly defined, which makes it very hard to achieve. The world has been pursuing a goal that was flawed from the start, as described in the glossary entry for sustainability. Social sustainability is the ability of a social system, such as a country, family, or organization, to function at a defined level of social well being and harmony indefinitely. Problems like war, endemic poverty, widespread injustice, and low education rates are symptoms a system is socially unsustainable. Environmental sustainability is the ability of the environment to support a defined level of environmental quality and natural resource extraction rates indefinitely. This is the world's biggest actual problem, though since the consequences of not solving the problem now are delayed, the problem receives too low a priority to solve. Economic sustainability is the ability of an economy to support a defined level of economic production indefinitely. Since the Great Recession of 2008 this is the world's biggest apparent problem, which endangers progress on the environmental sustainability problem.